Today we hear people moaning about the number of coffee shops or restaurants there are blossoming in the centre of any town, or city. This leads you to think that in the past, it must have been very different with a lack of these facilities, but this appears not to have been the case. It is very difficult to know where to start. I looked first at guide books, street directories, the internet and a variety of programmes, which contain a wealth of information. There was the Mermaid Café and Tea Lawn which was open most of the day and included in their provisions beach trays with freshly made pots of tea. The address was 3 Rock Gardens, basically on the site of the newer Rock Garden flats. There were numerous beach cafés along the seafront all promoting their beach teas, where you were given a “beach tray” with teapot, milk and sugar and the correct number of cups. You then took this tray onto the beach where you and your family would enjoy a good hot cuppa. However, you had to deal with the teapot which usually was a poor pourer. A major location on the promenade was the Highbury Tea Gardens over at least the 1920s and 30s. This was located on what is now the Regis Centre car park. In 1949 they advertised their Saturday night dances, which had a good band, good dancing and good company. The charge for this from 8pm to 11.45pm was single 3/- and 5/- double. A very different venue from today’s cafés. Coffees and teas were also available from the Pavilion with their Lord Loom chairs or the Polly Anne, which was in the High Street, another venue which evoked a lot of happy memories. One major outstanding feature of many of these premises was their opening hours – in many cases from 10am but for some it was 8am. The feature is the 11pm closing time and promoting that they were also open on a Sunday. What about the Marine Park Café overlooking Marine Park gardens? This is different from the others in that the premises are still here today. However, it is now the two-storey Waverley public house. Our most famous café is that belonging to the Macari’s family. Since they opened their first premises in 1953, on the Queen’s Coronation Day, their sites have included on the promenade, within the site of the Esplanade Theatre, and today, in London Road. I found an advertisement in a 1936 carnival programme for Bognor’s Café De Luxe, which adjoined the Odeon cinema in London Road. This café, as it showed, was a snack bar, soda fountain and milk bar, with music. There were also private dances and parties catered for and after theatre suppers. While advertised as a café, it was a popular venue with music provided on a regular basis. In fact, a pianist who was there for 12 months was then engaged by the Theatre Royal. In this programme, F.W. Woolworth advertised their Tea Bar. A further example of restaurants was the Burlington Lounge, situated in London Road, opened in December, 1956, as a Regency-styled restaurant. A chance remark by his wife about not eating in certain venues created the idea to open their own, new premises, with coffee made on one of the new Italian machines being served all day. However, at the end of one later advertisement, they mention that ‘So popular has been the demand for ‘Espresso’ Coffee it has been necessary to install a larger machine. We can now give a really excellent service”.One location that has been mentioned to me many times in the past is memories of The Polly Anne restaurant in the High Street, long gone, but was situated on today’s Morrison’s car park next to Iceland. This venue was originally an antiques shop and a wool shop from the 1920s until 1936 when the ground floor was converted into the welcomed Polly Anne, with net curtains. In Waterloo Square, we have The Rendezvous, which has some interesting pictures and place maps showing the history of our town. These premises have had numerous owners over the years, including Spicy Tan, New Orleans Restaurant and in 1955 was advertised as the Corner House Restaurant with a function room suitable for 100 people. Around this period, many restaurants promoted fish meals, but many also advertised Bognor lobsters and prawns. 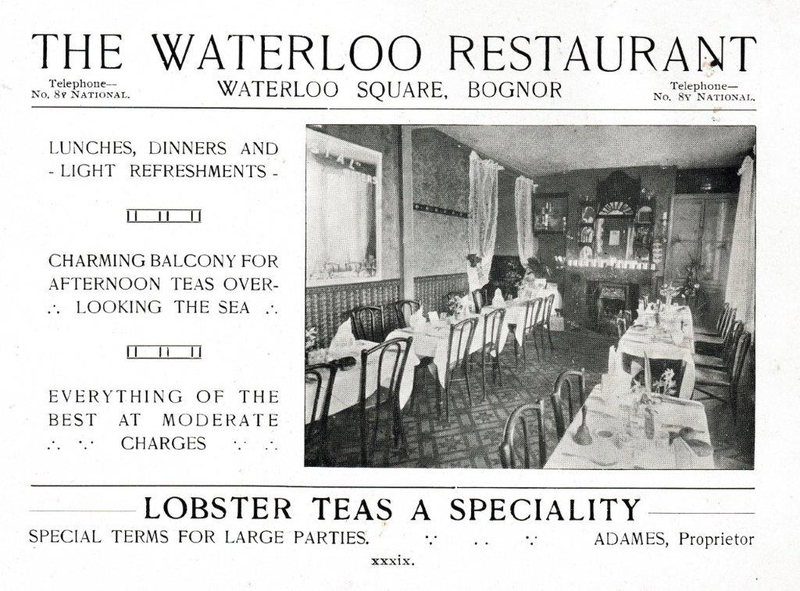 Also in Waterloo Square, there was an advertisement in the 1912 guide book for The Waterloo Restaurant again with lobster teas being a speciality. Who can remember the Tudor Rose, which was in London Road, near William Street? On a Sunday it was filled not with families but single people who worked locally but away​ from families. The waitresses wore long black skirts, white aprons and white mop caps. We never seemed to talk to other people on adjacent tables. This building had previously been a fish and chip shop. When the vast variety of venues available are looked at historically, it is interesting to note the size, and multiple use made of these premises. We may not require the facilities to have a tea dance, or a resident band today, but the ability to have meeting rooms for over 100 people I am sure would be helpful to many groups of people. I do know, however, that some of the new premises offer this facility. This is only a small snapshot of these type of premises and I am sure you can recall many more.